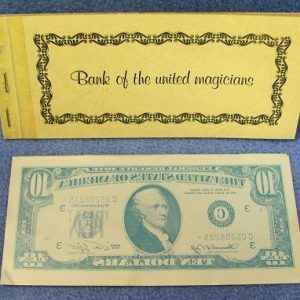 We acquired this from an old magician’s estate. It’s a really great set of gimmicked coins that allow you to perform many different and baffling effects. See effects below. It comes with all the coins and brass caps plus the original instructions and metal card. Some of the coins and caps will need to be cleaned up but everything works well as is. 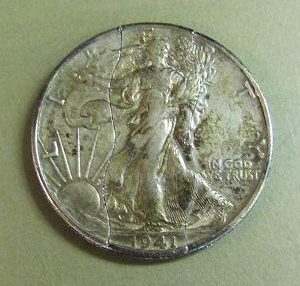 Effect # 1 – Two brass caps are shown empty, one is placed over a half dollar and marked by placing another half dollar over it. The second cap is marked by a copper coin and used to cover a second copper coin. By changing the upper coins and just passing your hands over the caps the coins underneath the caps are shown to have exchanged positions! The half dollar used as a marker is now vanished and this is now found under the cap marked with the copper coin. The copper coin changing into a half dollar. Effect #2 – A box of matches is shown and four are removed by a spectator. These are formed into a square and a copper coin is placed into the center. This is covered with a card and the closed match box. Upon removing the box and card the coin has vanished. The spectator now dumps out the matches and finds the vanished coin inside! 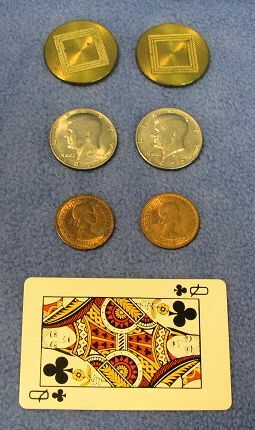 Effect #3 – Two coins are shown and placed upon a handkerchief. The combination is placed on top of a glass tumbler. A coin is selected and caused to penetrate the handkerchief. Effect #4 – A copper and silver coin are shown in one hand and by just closing the hand and re-opening it up again. One coin jumps to the opposite hand. Effect #5 – A copper and silver coin are placed into a glass. Suddenly one of the coins penetrates through the bottom of the glass! Effect #6 – Two brass caps shown are shown to be empty. Suddenly a coin appears between them!